LittleFox.com is one of the best sources of stories for children learning to read. There are stories of all reading levels, for kids aged 4 to 12. New stories are released each week, similar to your favorite TV series. My daughter loves one series in particular, Rocket Girl, the story of a normal elementary school student who secretly helps the mayor to save the town from super villains. To adjust the colors & settings, click on the button next to the address bar. The normal way to use the extension is to click the button next the address bar. This will allow you change colors, borders & font size to make it the easiest to read while forcing both eyes to work. LittleFox.com, however, has an full screen reading experience and removes the normal buttons you would use to adjust the colors with Lazy Eye Web Reader. To activate the colors for the red/blue reading, right-click on the screen to get to the Lazy Eye menu. Right click to bring up the menu to color the page. Rocket Girl is my daughter's favorite story series. 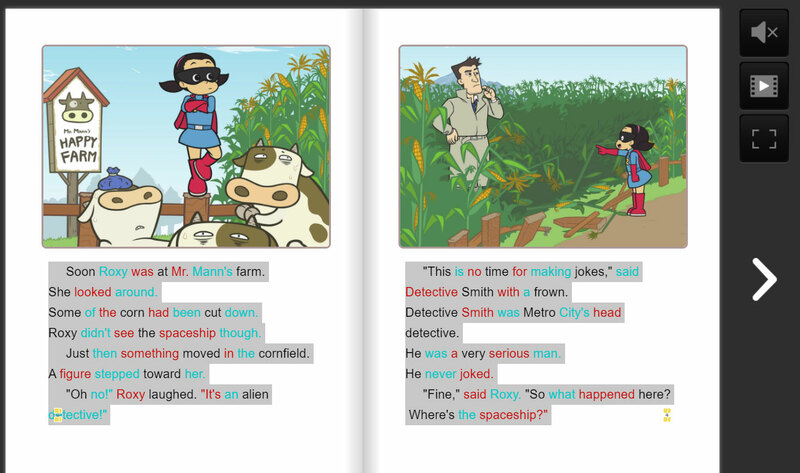 Here's an example of what it looks like with the Lazy Eye Training Web Reader activated. Please Note: To make it easier, you can increase the font size. Sometimes, this can push the text off of the page. To help with this, you can move the text around the page by clicking and dragging. I'm also continuing to work on this Chrome extension to allow it to support more sites. If you would like to have it work on a site that it does not support yet, please leave a comment below. A good library of books & best presentation. Well worth the $5. Great presentation, limited selection of good books. Allows you to make your own books, though. Great potential resource. Has a good selection of classic free books. Presentation is okay, but not on the level of MeeGenius or StoryJumper.